Well hello strangers! Although it is only a month since I last posted it feels like a lifetime! March brought quite a lot for me I what did it bring for you guys? First of all my Crohn's stricture got so bad that I was no longer able to drink my fortijuices never mind being able to eat. This was not good! 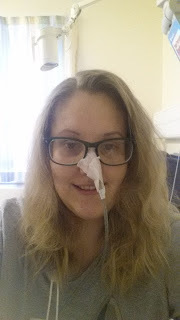 I ended up being admitted to hospital on mothers day. Poor ma! Oooh! That reminds me I did use some coconut oil for making ma some pressies. I decided to make a hair mask, a conditioner and some lip gloss. 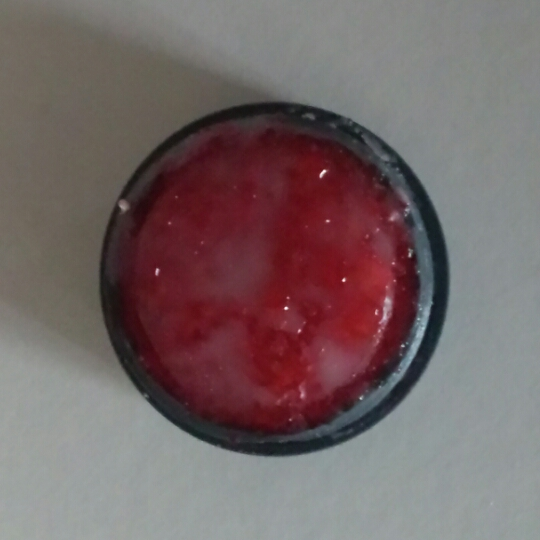 The lip gloss was definitely the most successful thing I made and it tasted quite yummy. :) The hair mask though just kinda made my hair greasy (of course I tried them out too! lol) Was nice to have the chance to try making some toiletries as I have wanted to do this for an age and never really got the chance to do it! 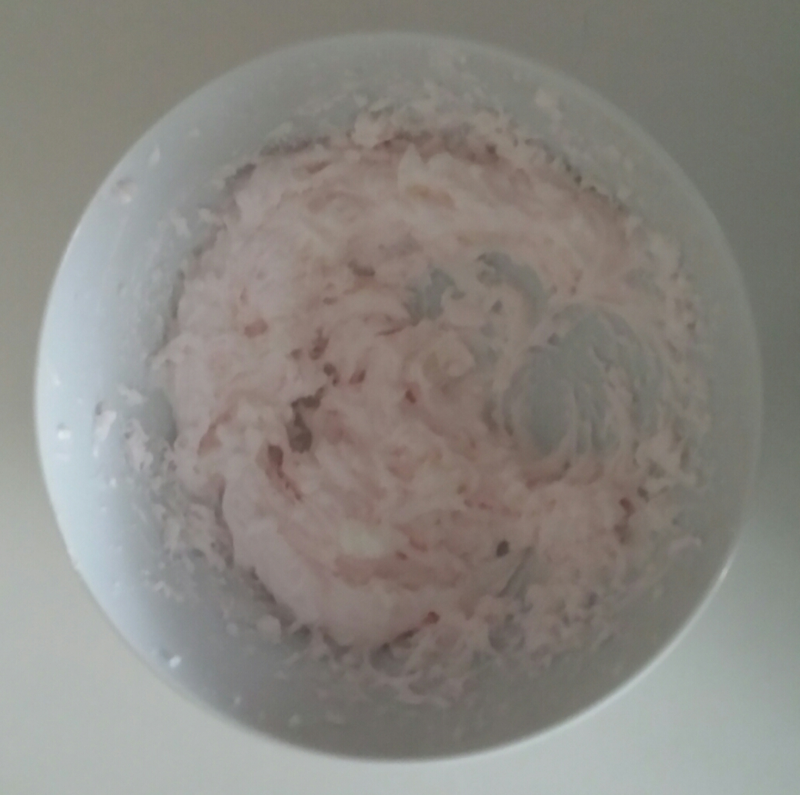 Have any of you made some of your own toiletries? I got the recipe for the lip gloss from Youtube here! 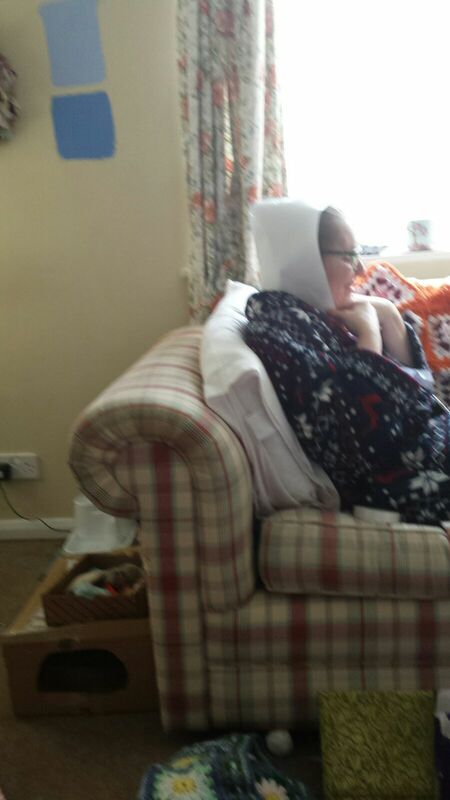 Well like I said mothers day after my bro went home I was sick and that was my cue to head back to A&E. It was quite a long wait and ma was distressed because I couldn't sit still (it was just so hot in there and I was so uncomfortable.) I really hate being sick and feeling sick! I am sure there is not many people who do like it to be fair! Luckily I was booked for a gastrojejunostomy (a bypass) on the 17th anyway (for the stricture that became completely blocked) so I didn't have to have an emergency operation which I really didn't want! I also had a bag packed and ready so that ma could just pick it up for me! This time it was quite a horrid experience and much more invasive than the other times I have been in recently. They had to put a nasal tube in to drain my stomach urgh! It was possibly the most horrid thing I have had done yet. (Being sick as it was going in didn't help to make it pleasurable!) I feel so sorry for anyone who has to have one put in because you cant help but want to pull it out as they are putting it in! I suppose it was good though as it drained three liters of fluid and certainly made me feel more comfortable. Having it in for 11 days was definitely 10 days longer than I wanted it in for though, that's for sure! Funnily enough when it fell out on the 15th I totally freaked out about them having to put it back in and had a good sob! The only time I have freaked out more is when my consultant wanted me to have a second endoscopy! I always manage to get through it though. Usually with a smile too! Have any of you experienced this? On fluids, IV meds and nutrition! I also had another ultrasound and a CT scan too. There is a funny story there too. The hospital I was at is a teaching hospital and so the doctors come round in a morning and it feels like there is millions of them. They surround your bed and then one of them (usually one of the junior doctors or the consultant responsible for them) asks you questions and tells the nurse in charge what they are going to be doing. I learnt over time that you don't find anything out unless you ask so that is what I did. The consultant (who was actually very nice as they seem to be) mentioned me going for a CT scan so I said "well I am a bit concerned about that because you have to drink the prep and obviously nothing is going down due to my stricture so how will that work?". Cheeky aren't I? One of the junior looked at me as if to say 'it will be fine' but the consultant did discuss it with my surgeon first so it was a good thing to mention! I did mention things like this a lot when they came round doing things and giving me drugs etc. I had to take tablets as well with my nasal tube in (bit painful, like swallowing a chip the wrong way or a crisp in fact felt more jabby!) and I did ask the nurse if that would work as obviously everything was coming back up the tube. She said it should be fine-but I saw it come back up within the hour so they put me on IV meds after that! They also decided that as the blockage was stopping me eating they needed to give me some nutrition so that I was fully prepared for my surgery. 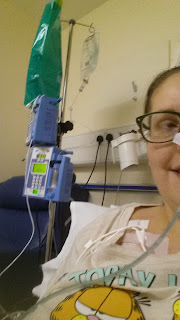 They recommended a Hickman line to make it easier. Wow! It was mighty painful when they fitted it and I felt so awful I cried. I don't usually cry in front of people but that was just a bit traumatic! At the time I was also a bit unsure what exactly they were doing which weird-ed me out but I am super pleased that I was feeling so pants that I wasn't my usual 'lets google of truth that'. I don't think I would have said yes so readily if I had looked it up! I also think I would have freaked out too! I only looked it up after I got it taken out on my discharge day. I was pretty amazed at how long the bit that had been in my body was so I was compelled to find out where it went as it turns out it went right into my heart. Impressive but totally creepy. What do you guys think? 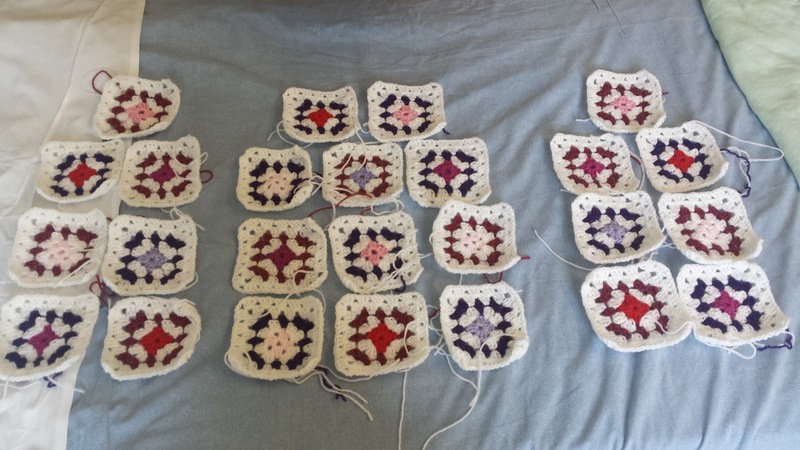 My squares laid out to ensure my colours coordinated! Look at all the squares ready for some colour! I did even do some doodles and measurements etc to make sure that it would work for me. 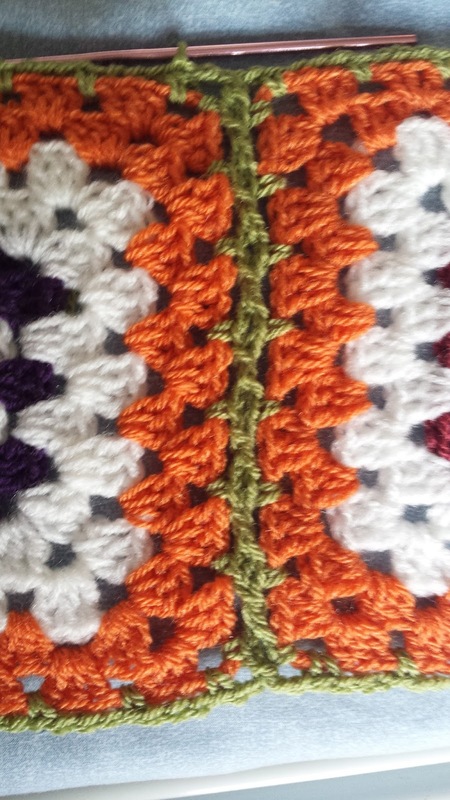 Planning is not something I really do so I was quite impressed lol I then just had to add my beautiful orange around the granny squares! This was something that was easy to do as I can do it in my sleep I think and also I could just do one and then have a nap if I needed to! As I had a pretty poor signal in hospital and obviously the days are excessively long my crochet certainly kept me sane! I wanted to join my squares in a new way for me so I spent a few hours when my signal was okay looking for something that would be pretty and go with the vague idea of what I wanted my cardigan to look like. 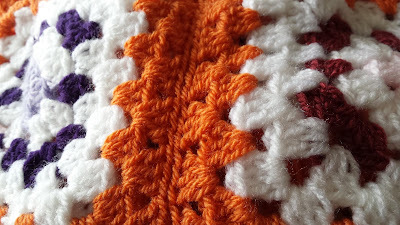 I found this very good blog post which had some really nice ideas for joining granny squares so I tried the Flat braid. 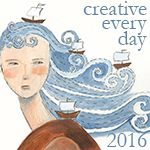 This is a really easy to follow tutorial and is such a pretty join. It looked lovely. 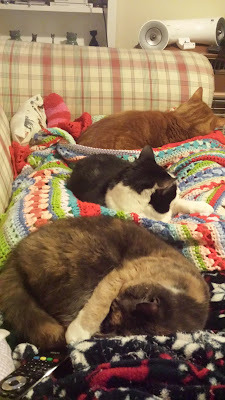 When I got home though I re-thought this join as for my cardigan I didn't think it would be durable enough and for some reason it just wasn't quite right. 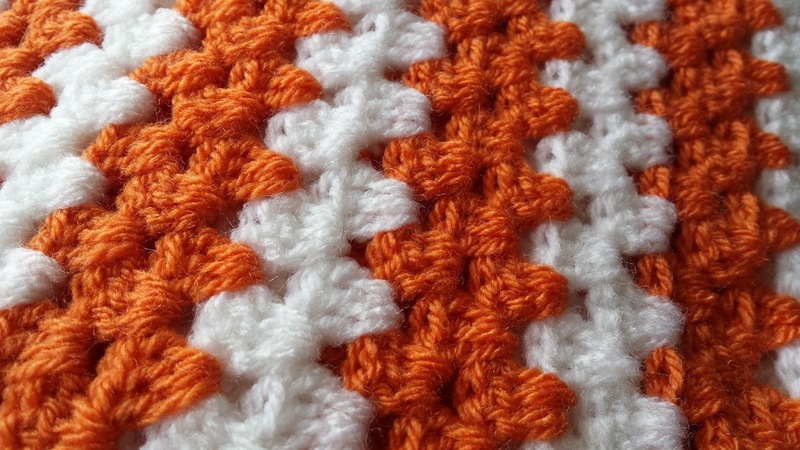 So I decided to just do my joins as slip stitches using the back loops only as it just makes a more dense join. Obviously when I got home I was feeling much better not least because I could eat again (even though I can only manage small portions and I am being very careful! ), I got to have hugs and cuddles with my moogles who I missed so much, and got to sleep in my own bed and not be woken up at random times to check blood pressure etc. I had really missed my home. It seemed like a long time to be in! I came home on the 23rd and that was 17 days! Eeek! 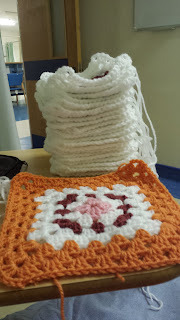 Anyway I got cracking on with my crochet as I wasn't allowed to lift anything and ma was looking after me! I decided that my sleeves should be granny stripes rather than granny squares! 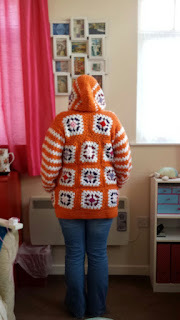 Just thought it would make it a bit different to the ones on Ravelry. 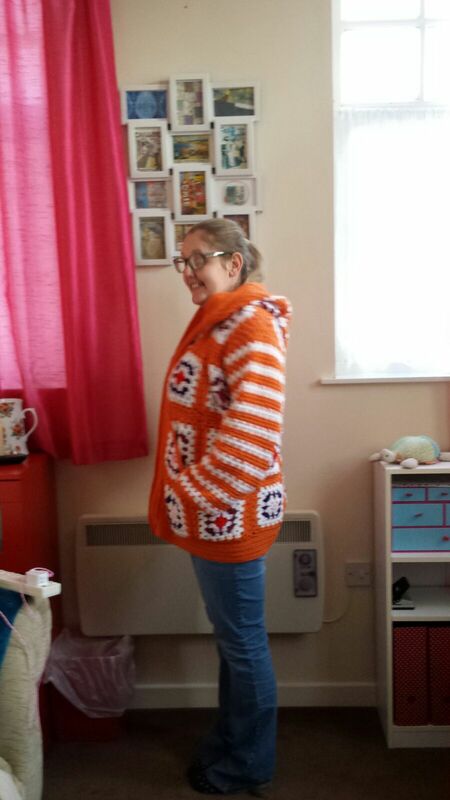 It was at this point that I decided my cardigan needed a hood and that in actual fact it is going to be a hoodie! I started to completely formulate the image of what I wanted it to look like in my head. 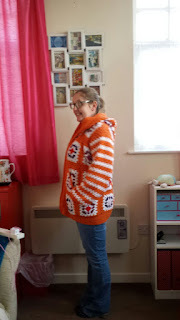 I feel it is very important at this stage to share a fantastic photo that had me and ma in stitches as we pondered the best shape and way to add my hood! I don't know if this will make you laugh as much as we did but I hope it does as it was very funny. I think mainly because ma wasn't expecting it and so when I stuck some paper on my head and said "what do you think" it took ma by surprise and really cracked us both up! Finished back-Look at all those squares! Weird face but just look at my sleeves! So here is the finished version! Completed exactly two weeks after I came out of hospital! 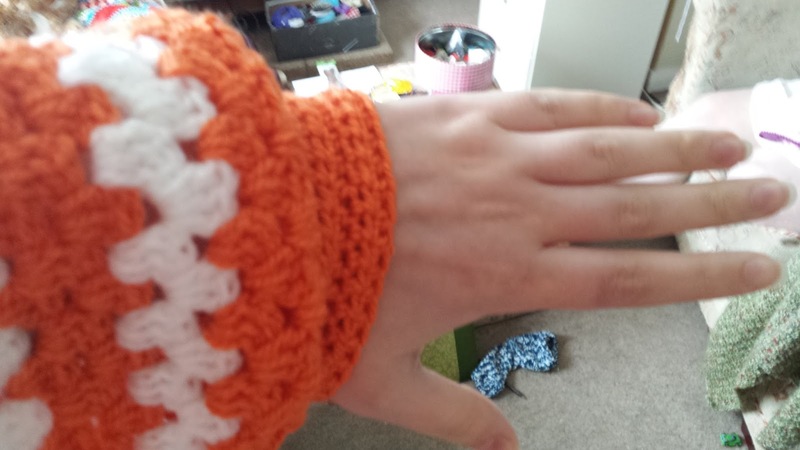 It is very cosy and comfy and was surprisingly easy to make. 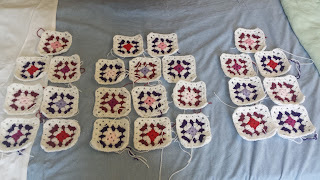 I am going to be writing up the pattern and ma will proof read and test for me.